Hand vs Machine Film: Which is Best for You? Hand Film is used with manual stretch wrappers which use the power of the operator. The operator stretches the film using a breaking handle on the wrapper while walking around the pallet. Hand wrapping is typically designed for those who unitize less than 10 pallets per day, have decentralized warehousing or need a backup to powered stretch equipment. Machine Film is used with powered stretch equipment. There are several different types of powered stretch equipment available today. The most common is the rotary spiral pre-stretch machines. The Rotary Spiral Pre-Stretch machine wraps the pallet load in a spiral fashion using film widths of 20” or 30”. Rotary Spiral Pre-Stretch is the most popular means of applying stretch film today and is the most widely used type of stretch film equipment. Pre-stretch isolates the film from the load, thereby enabling the film to be used at much higher performance levels than conventional rotary stretch equipment. In conventional rotary stretch wrapping, the turntable is pulling the film against a breaking force on the roll. With pre-stretch, the stretching takes place either between two geared rollers or one powered and one driven roller . This provides greater and more uniform stretch, less neckdown and enables the operator to adjust the force of the load. What is a gauge band? These are hard or soft rings on a roll of film which are caused by very slight gauge (thickness) variations in the film. Often gauge bands do not result in any wrapper failure. If a failure does occur it will result from a wrinkle in the band area. It will appear as a slit starting between the prestretch rolls. How are freight charges handled? All of Paragon’s films are shipped FOB destination freight prepaid. We require a two (2) skid order minimum. How many pallets of product can you fit on a truck? The number of product pallets that can fit on a truck vary depending on the weight of the pallet. To quickly calculate a rough estimate, divide the weight of one product pallet into 40,000 lbs. For example if the product pallet weighs 1200 lbs, then roughly 33 pallets will fit on a truck (40,000 lbs. / 1200 lbs. = 33 Pallets). Do you break skids down and sell individual rolls or boxes? We only sell our film in pallet quantities. We require a minimum order on most standard products. Where is your film manufactured? 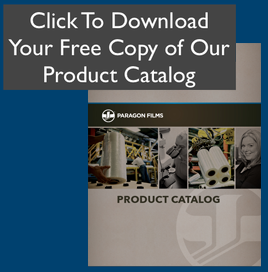 All of Paragon’s film is manufactured and warehoused in Broken Arrow, OK, Taylorsville, NC and Union Gap, WA. How do you become a Paragon distributor? To get your answers or to get the process started you can contact a rep here. I am a Paragon distributor, can I use your logos and images on our website? We do allow our logos and images to be used on other sites. Fill out this form to request to use our logo/images on your site. Do you print on film? No, Paragon does not print on any of our film. However, we are happy to customize products to meet your most demanding applications when possible. Please contact Paragon’s Customer Service Department at 1-800-274-9727(WRAP) to find out more information.